An implant is a titanium "root" which can be placed into the jawbone. Once integrated with your bone, the implant can be used to support a crown, a bridge or secure a complete denture. Dental implants may be used to eliminate partial plates and dentures. Implants have been used successfully for over thirty years. Implants have a high success rate and function and feel like your natural teeth. 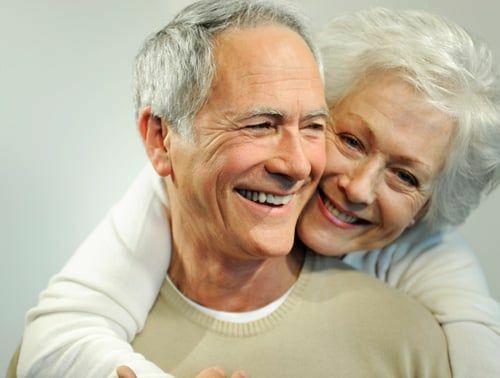 Dental implants are now the standard of care for replacing missing teeth. Dental implant treatment represents a slightly greater investment than conventional treatment; however, the benefits of implant therapy for most patients outweigh the minor additional cost involved. Although dental implants have become the standard of care they are more expensive than old tooth replacement methods. They are a better choice for the money; however, some dentists still recommend traditional tooth supported bridges for patients due to their own comfort level, or when patients insist on having the immediate lowest possible fee for tooth replacement. Most dentists today detest the idea of grinding down perfectly healthy teeth to place a traditional bridge, and therefore, will almost always recommend dental implant treatment in these cases. Vs. Crown & Bridge - The issues related to a crown and bridge single tooth replacement include the alteration of two healthy teeth, and eventual gum resorption that could possibly expose tooth roots to caries. Two healthy neighboring teeth are shaped to receive an anchor retainer crown. The soft tissue under and around the false tooth will eventually shrink possibly exposing the tooth roots of the neighboring teeth that support the anchor retainer crowns. Exposed root structure is susceptible to caries. Gum resorption often distracts from the appearance of the smile. With a dental implant healthy neighboring teeth are left untouched. The implant acts as an artificial tooth root thus eliminating gum tissue and jawbone resorption. Vs. Dentures - Within 6 months of starting to wear a denture, you will have already lost about 40% of your jaw bone structure. If you have worn a denture for a few years, you already know about bone loss. The reason your denture doesn't fit like a year ago, is that you don't have the same jaw bone structure to support it. If you wear a partial denture, beware that you will have the same problem with bone loss. A dental implant is the logical choice to help stop bone loss, however, once the jaw bone structure is lost, your options become limited. In addition, removing a denture or a "partial" at night may be inconvenient, not to mention that dentures that slip can be uncomfortable and rather embarrassing. In cases where multiple teeth are missing or have been extracted, multiple implants can be used to bring back your smile. The implants are placed into the jawbone and are given time to heal. After the bone has healed around the implants an abutment is attached to the implant which then allows for a crown or bridge to be placed right on the implant. These new teeth will look and act just like natural teeth. Ask Drs. Martin & Carly Polin, popular implant dentists in Hauppauge, if dental implants are right for you. Dental implants that can be placed to accept a full arch of teeth. The arch is removable yet functions like a full set of normal teeth. This prosthesis is used in special situations for patients who have enough bone in the front regions of the lower or upper jaws, but limited amount of bone in the back regions and are not candidates for extensive bone grafting.